This edition of One-On-1 features Drummer Jacqueline Cassell! Jacqueline has been playing the drums for 6 years now, but she has the skill and style of a music veteran. I had the opportunity to speak with Jacqueline about her music, life and a few of today’s issues. Not only is she an awesome drummer, she’s a really good person and has a kind heart. 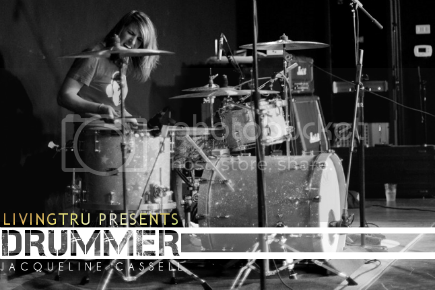 You know what to do, click the link to find out more about Drummer, Jacqueline Cassell! Jacqueline! Thank you so much for coming through! I have quite a few questions for you, so let’s get into it! For starters, how long have you been a musician? I have been playing drums for 6 years now, but when I was younger, I started playing the piano around age 6, I picked up the acoustic guitar and bass guitar not too long ago. It's nice to have an instrument to fall back on when you can't make all the noise you want on the drums, anytime you want, and I think its really important for any musician to play multiple instruments. Not only is it an impressive task, but it also broadens your musical horizon and you learn more about what really makes up music today. That’s true. It also keeps you from getting bored with one particular instrument and it‘s nice to see how each one differs. So, as far as drumming goes, where do you get your musical influence? I'd say most of my influence comes from drum teachers I've had in the past, and of course drummers I've met, but currently I am really influenced by the drummers and musicians that I see on Youtube. I get so many messages and emails from viewers and musicians sending me videos of their drumming and its so great to see how passionate they are and it really motivates me to keep playing. That’s so cool! It’s great when your peers keep you motivated, but what about your family? Are they musical? If so, what was it like growing up? Wow, so you’re really the first to pursue it professionally in your family huh? Most musicians have a musical background, but the fact that you don’t shows that this is definitely a gift. So, even though you may not have gotten musical talent from your parents, what’s some of the best advice they’ve given you? My parents are such awesome people. I'm so lucky to have them as parents. They've always told me, especially the past few years as I graduated high school and got into college, to follow my dreams. I know that is so cliche, but my Dad always tells me that he wants me to be happy and do something that I am going to wake up everyday and be so happy to be doing, and right now that is music. I can't see myself sitting in a cubicle everyday crunching numbers. My parents have taught me that life is short and you need to make the best of it and do what you love! That’s great advice! I know it’s something that we hear a lot, but that doesn’t make it any less true. Life should be fun! So, what is it that you would like to express through your music. What would you like the world to know about you? I put all of my heart into every one of my drum videos and I have all of you guys to thank! I wouldn't be where I am today without you. Drumming is something I am truly passionate about and I plan on doing it for years to come, but I really genuinely appreciate every single one of you viewers!! Great! We appreciate the videos lol! Alright, I have one more question for you as far as the music goes, and then I’d like to get into some other topics. Where do you see yourself, musically, 5 years from now? I will definitely still be drumming, but do not know where or for what! But that’s the love of it all, I can't wait to see where this crazy world of Youtube brings me. It's gotten me to places so far that I am so grateful for, and I can't wait to see what is to come! Me either! I know whatever it is, it’s going to be big and I can’t wait to see it! So, we’re getting down to the last few questions and I’d really like to pick your brain about some other things. LivingTru is about changing the world and making the it better, what do you think you can contribute to society to do just that? I'd love to take the gift of music and spread it around the world. I want to do mission trips to third world countries in the future years, and work with my church to spread the importance of music and worship. I believe music truly has a healing power, and its universal, that’s what I love about music! That’s so true! Music, in my opinion, very influential and really has the power to kind of dictate your current state of being. That’s why it’s so important to be careful about what kind of music you take in, and to keep it positive. Speaking of that, what do you consider "Positive Energy" to be? Positive Energy is what you make it to be. Energy is energy, but its up to you to make it either negative or positive. Positive energy is what motivates me everyday to get up and enjoy life. It's what inspires me to keep posting drum videos, it's an important thing! Awesome! So back to the music briefly, I see that you have a lot of views and subscribers on Youtube, and the response that you get from people is really good. Do you plan on pursuing music and performing professionally? When I started posting videos on Youtube about 5 years ago, I never thought It would go anywhere, and to now have over 3.5 million views, it really just is unreal. I am at a point where the exposure is overwhelming...I've had people I look up to tell me they've seen my videos, or come across my videos, and that just blows my mind! The internet is truly amazing. But anyways, back to the question...I've come to a realization that I've worked so hard, and continue to do so, on my videos, that it would seem foolish to not do anything with my drumming at this point. It would be an absolute dream to play drums professionally...is that my calling? Only God knows, but boy, do I hope He likes my drum videos, ha! Haha! I’m sure he does! After all, He is the one that gave you the talent. For my last question I was going to ask whether or not you believe in God, but you’ve already answered that lol. So I guess, what I’ll ask is what role does God play in your life? It may be last here in this interview, but absolutely not least in my book! Wow where would I be without God? Well not here, we know that! I am just so blessed with a great family, friends, fans, etc. and God continues to bless me in ways that a million thank you's wouldn't be enough. I am very involved in my church back at home, and here in the ministry on campus here at college. I don't know what I would do without my Lord and Savior, he is my everything, and I am so grateful for that! He is the way, the truth and the life! That he is!!! Thank you so much for speaking with me Jacqueline! It’s been my pleasure! Everyone be sure to subscribe to Jacqueline’s Youtube channel and connect with her on all of her social networks! Check out Jacqueline's Drum cover of "All I want" below! Girl drum players are way cool! Love this!! !